The strength and beauty of his musical accomplishment has long been overshadowed by his public personna. For Oscar Levant, his own music has been silenced by his presumed character: the acerbic crank on the Jack Paar Show; the Broadway showman and Hollywood star; the author of preposterously acute and funny books; the radio and television ringmaster; the concert pianist and Gershwin specialist. No kaleidoscope could serve these many split images. Two decades after his death, the time has come to re-examine his work as a composer of strong and original music. He was, after all, the beneficiary of a powerful education in classical music and piano technique. He studied composition with Arnold Schoenberg and piano with Zygmunt Stojowski. At the height of his career, he performed under the batons of Toscanini, Beecham, Mitropoulos, Reiner, Monteux, and Ormandy. It doesn't help matters that he would not take seriously – at least in the words he used to describe it – his own concert music. Over a decade, he did write string quartets, a woodwind trio, a sinfonietta, and a piano concerto of genuine art and complexity. "This concerto is fourteen minutes long, mostly in fast tempo, relieved with an all-too short slow section. Composed in the late Thirties, this music reflects an arrogance and a pretentiousness based on an economic and emotional insecurity. However, those are days we now look back on as happy." Born to a musical family in Pittsburgh on 27 December 1906, Levant began piano lessons under the tutelage of his older brother Benjamin. By the age of seven he was studying with Martin Miessler, a graduate of the Leipzig Conservatory who specialized in the Czerny piano method. His early repertoire included Bach, Beethoven, Chopin, Liszt, and Schumann. Within a year he was giving public recitals. At the Fifth Avenue High School he came under the wing of instructor Oscar Demmler, a mentor who would take his students to the recitals of Paderewski, the concerts of Stokowski, and invite Oscar to accompany him in violin and piano repertoire, all this by the age of twelve. Here, he first played in public with orchestra. After the death of his father, he was taken by his mother to New York in 1922 in order to deepen his musical apprenticeship. He began work with the well-regarded piano teacher Zygmunt Stojowski (1869-1946), a compatriot and disciple of Paderewski, and himself a student of Zelenski, Diémer, and Delibes. Here began his first appreciation of Broadway's glamour, its characters and allure, and an early career as pit, nightclub, and restaurant pianist. Although he played for Paderewski at a private recital in early December 1922, Levant was equally – or more – attracted by bookies, showgirls, gangsters, and Gershwin. While rapidly ascending on wings of talent and wit into the highest circles of New York popular music, Levant seems nonetheless to have made time to attend concerts, recital and opera, hearing the leading artists of the day. In 1926, he toured London in cabaret; in 1929, he first travelled to Los Angeles, so to join the burgeoning group of New York composers and performers assigned to give film a musical voice. Over time, he would compose for, and appear in, numerous Hollywood films. In the same period he would retain a New York presence, writing for Broadway and Tin Pan Alley. It was through composer-arranger Robert Russell Bennett that Levant returned to the concert stage. On 19 July 1930, he joined Bennett in his March for Two Pianos and Orchestra under Karl Krueger at the Hollywood Bowl. On 14 August 1931, he perfomed the same March at Lewisohn Stadium in New York. He was just 24. A year later he sat with George Gershwin, playing second keyboard in a two-piano version of the Second Rhapsody for conductor Arturo Toscanini. In 1932, unannounced, he turned to serious composition. He began work on what would become his Sonatina for Piano. Hearing the first movement, Aaron Copland asked Levant to give its premiere at his new Yaddo Festival of contemporary American music. He did so on 30 April 1932. It was well-received, even lauded by Irving Kolodin, and eventually published. Later that year he started sketching an orchestral work, Sinfonietta. On 16 August 1932, in Lewisohn Stadium, he played the Gershwin Concerto in F for an audience of 17000. He would not give another public concert for five years, although he made many radio broadcasts of popular and light classical standards. Back in Hollywood, he evidently wrote a parody of French opera, Le Crayon est sur la table. In Levant's description, it was written "using all the Debussy clichés from Pelléas – the descending fourth in the voice parts, the parallel seventh chords, and the interrogatory 'Pour-quoi?'" No written trace of this opera has survived. In 1934, at Gershwin's suggestion, he began studies with Joseph Schillinger (1895-1943). This Russian-born theorist and composer had become a kind of teacher-to-the-stars whose clients also included Tommy Dorsey, Vernon Duke, Benny Goodman, and Glenn Miller. Schillinger wrote books on rhythm and harmony, and a number of large symphonic works. With him, Levant studied compositional plan and harmonic analysis, much of this based on a purely mathematical examination of tonal order. On 25 February 1934, Levant's three-movement Sinfonietta was premiered under the baton of Bernard Herrmann in a concert of American music at New York's Town Hall. It too was well-received. In 1935, ostensibly to continue his work as film composer, he once again headed for Hollywood. This time, however, Levant would enter into the most serious and productive period of study and accomplishment in his concert career. He began work with Arnold Schoenberg. One of the most remarkable and influential minds in twentieth century music, Schoenberg (1874-1951) needs no account here. It will suffice to say that, once in Los Angeles, he attracted a considerable retinue of young Hollywood composers, among them Alfred Newman, Marty Paich, David Raksin, and Franz Waxman. Levant lived in this charmed circle for three years, taking lessons and providing household services, and studying in session as little as once and as many as eight times a month. According to the Schoenberg diaries, as reported in Kashner and Schoenberger, lessons were given from April to September 1935, and from October 1936 to November 1937. During his three years with Schoenberg, he was able to produce the Piano Concerto, the first String Quartet, and the Nocturne for Orchestra. The latter was released by New Music Editions in 1936, his only orchestral score to be published. First screened in October 1936, Levant's 'opera' added to his growing list of concert music. It appears within the 20th Century Fox film Charlie Chan At The Opera, and stars Boris Karloff and series regular Warner Oland. The opera attended in the film was called Carnaval, and many music cues have survived. The clichéd libretto was written by William Kernell, and then translated into Italian for authenticity's sake. The music alone runs roughly a quarter-hour, and was orchestrated by Charles Maxwell. On 14 April 1937, in a WPA-sponsored orchestral program given at the Trinity Auditorium in downtown Los Angeles, Levant conducted the premiere of his Nocturne for Orchestra. The conductor of the Los Angeles Philharmonic Orchestra, Otto Klemperer, came backstage afterward and gave composer Levant and teacher Schoenberg his congratulations and approval. Three months later, on 11 July 1937, Gershwin died at age 38. His passing was to propel Levant into the final compositional and concert phase of his career. On 8 September he played the Concerto in F at the Gershwin memorial concert in the Hollywood Bowl. Conductor Charles Previn (cousin to André's father) led the orchestra in front of 22000 people. Thus began two decades in which Levant was seen as 'the' rightful performer of Gershwin's piano and concert music, the leading interpreter, the bearer of the torch. In October, Denver Colorado was the site of a festival in honour of Arnold Schoenberg. His music was performed, as was that of only four pupils: Berg, Strang, Webern, and Levant. On this occasion, the first String Quartet was performed by the Kolisch Quartet (1922-1939). Levant did not attend. Its first two movements, evidently conceived as a unit, were originally entitled 'Two expressions for string quartet'. Examining the manuscript, one may plainly see that Levant later added above the line a new word, the title now reading 'Two sentimental expressions for string quartet'. The music, of course, is anything but. Robert Russell Bennett, WOR radio, December 1940: "I wonder if you remember the impression the work made on its first performance?" Levant: "Violently. It not only brought me obscurity but many enemies." In 1937, Levant began composing his Suite for Orchestra, and by February 1938 had completed its orchestration. The slow movement, Dirge – Andante, was evidently the most difficult; it is certainly the most heartfelt and vulnerable. He dedicated it 'In Memory of George Gershwin' and, ever since, it has often been played as a single work. In October 1938 Levant made his debut as a Broadway conductor, taking over for his brother Harry in sixty-five performances of Kaufman and Hart's The Fabulous Invalid, a work for which he had also served as music director of its revue format. He would follow in January 1939 as composer and conductor of The American Way, another Kaufman and Hart production. In the spring of 1939 he worked as a film conductor for director Joseph Losey. The project, Pete Roleum and His Cousins, was an industrial film first screened at the New York World's Fair on 22 May 1939. The score was composed by Hanns Eisler. Its twenty minutes featured 3-D animated puppets filmed in Technicolor, all in aid of persuading the public that the oil industry was doing its wartime part. The part-set is preserved in the Levant Archive at USC. On 10 July 1939 Levant re-asserted his role as the leading interpreter of Gershwin, playing the Concerto in F at the second Gershwin Memorial Concert at Lewishohn Stadium, this before a crowd of 18000. On 24 November 1939 he played the Concerto under Fritz Reiner in Pittsburgh, and made his local conducting debut in the Dirge from his Suite for Orchestra at the same concert. However, even with an audience sentimentally pre-disposed to this remembrance of Gershwin, the work failed. On 10 December that year he played the Rhapsody in Blue under Canadian conductor Wilfred Pelletier for the CBS radio program 'Ford Sunday Evening Hour'. He also gave two short Chopin works. So began a period of travel in which he would invariably perform Gershwin in concert, and occasionally add a composition of his own and a few Romantic piano works as well. In this time he concertized with the principal orchestras of Chicago, Cincinnati, Cleveland, Minneapolis, San Francisco (under Monteux), St Louis, Toronto, Washington DC, and at festivals in Los Angeles, New York, and Philadelphia. For more than a decade he also appeared in recital, often animating the proceedings with spontaneous remarks of a rude and revelatory nature. By 1940, Levant had finished two more orchestral works: Caprice for Orchestra, a nine-minute piece conceived for Robert Russell Bennett's radio program, and Overture 1912, also known at various times as A New Overture and Polka for Oscar Homolka. The latter was premiered by Frank Black and the NBC Radio Orchestra in late 1940. Caprice would subsequently be promoted by conductor Thomas Beecham and performed in Minneapolis, Pittsburgh, Rochester, and St Louis. Later, it would often be conducted by Levant himself. For Bennett's radio program he also gave the premiere of a short solo work, Poeme for Piano, renamed by Levant as Insult for the Piano or The Lone Ranger in Vienna. Its manuscript does not appear to be among the miscellaneous papers in the Levant Collection at USC. On 17 February 1942, his Piano Concerto was debuted by conductor Alfred Wallenstein and the NBC Symphony Orchestra from radio studio 8-H in New York. Wallenstein (1898 – 1983) made his early career as cellist, rising to Principal under Toscanini and the New York Philharmonic in 1929. He took up conducting and from 1943-1956 was to serve as music director of the Los Angeles Philharmonic. For this broadcast, Levant played the solo piano part. "His music, like his mind, is tough and real and animated by a ferocious integrity… it is friendly and good music, all of it. It is even, beneath its trappings of schoolboy homage to Gershwin and Schoenberg, hard and lonely and original music, full of song and solitude." Much-praised, it would be the last major concert work Levant composed. However, under the aegis of producer Goddard Lieberson and Columbia Records, he was to begin a significant series of recordings. His repertoire with that label, and air-checks later released by competitors, ultimately included solo piano work from the standard repertoire, Gershwin and others with Toscanini, Reiner, Ormandy, Kostelanetz, Wallenstein, Efrem Kurtz, and Morton Gould conducting, Tchaikovsky's first piano concerto with Ormandy, and Khatchaturian and Anton Rubinstein under the extraordinary baton of Dmitri Mitropoulos. A curious enterprise from the series includes a 1946 set of excerpts from Wagner's Tristan arranged for piano, violin, and orchestra. This recording featured Levant, violinist Isaac Stern, and conductor Franz Waxman, and was written for the sound track of the film Humoresque. There, it served as underscoring for the death of Joan Crawford. On 4 April 1944 he again played the Gershwin Concerto on radio, this time with Toscanini and the NBC Symphony. An odder pairing of musical personalities could hardly be imagined. In the summer of 1945 he appeared as himself in the Warner Brothers film Rhapsody in Blue, a loose-fitting biography of George Gershwin. Here Levant plays the Concerto in F and the Rhapsody. Levant wrote many of his own lines. He may also be seen playing the same concerto in the 1947 20th Century Fox film You Were Meant For Me. The remainder of his career was filled with work in radio, film, television, writing, and increasingly rare concerts and recitals. On 14 January 1947, at the invitation of President Harry S Truman, Levant gave a recital at the White House. On 29 December 1949, he finally made his Carnegie Hall debut, this with Mitropoulos and the New York Philharmonic in the Gershwin Second Rhapsody, the Honegger Concertino, and the Khachaturian Concerto for Piano. "His singing tone is melting and beautiful… he could go far as a virtuoso, farther than he went last night." In the 1949 MGM film The Barkleys of Broadway, Levant is seen playing excerpts from the Tchaikovsky Piano Concerto No. 1, and from Khachaturian's Sabre Dance, a recital and recording favourite of his. Both works offer unusually good aspects of his technique. In An American in Paris, MGM 1951, Levant plays every instrument in the orchestra during a fantasy Concerto. After this film, however, his concert appearances would be more often cancelled than honoured, leading to a strange 'banning' initiated by President James Caesar Petrillo of the American Federation of Musicians. Although the two were ultimately reconciled, it was the final step toward cessation of concert activities. Stage fright, over-medication, neuroses beyond parody, extended hospitalizations – all this, by the early 1950s, conspired to end Levant's concert career. With a final appearance in the Gershwin Concerto in F at Lewisohn Stadium in the summer of 1953, in the same work two years later under Howard Mitchell and the National Symphony, and an Indian Summer of six concerts in 1955, it was nearly over. In 1958, he appeared on the Eddie Fisher Show, a nationally-broadcast television program. In the USC Levant Collection may be found an eight-page piano-conductor score for a Piano Concerto in B Flat Minor, evidently written for Fisher and adapted from Tchaikovsky. On 2 June 1958, to the astonishment of a sold-out Royce Hall audience at UCLA, gathered for the Los Angeles Music Festival, conductor Franz Waxman led Oscar Levant onstage. Together, they performed the second piano concerto of Shostakovich. Playing from memory, Levant lost his place in its first movement, stopped, and declared to the audience, "I don't even know where I am. I'm going to start all over again." He did, succeeded, and earned a roar of applause from the audience. Three days later he went back to the studio. For Columbia, he recorded the album Some Pleasant Moments In The Twentieth Century, featuring music of Debussy, Mompou, Prokofieff, Ravel, and Shostakovich. 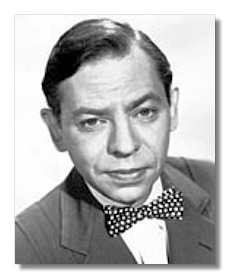 His last album, Oscar Levant at the Piano, was recorded in the same period but not released by Columbia until 1961. On 2 August 1958 came his final public appearance in concert. Although he attempted to cancel part-way through the Gershwin Concerto, while actually onstage, Levant was kept in motion by conductor André Kostelanetz. Levant finished the work, brilliantly. Before offering the first of two encores, he advised the audience that he was "playing under the auspices of Mt. Sinai." "There is a fine line between genius and insanity. I have erased that line." 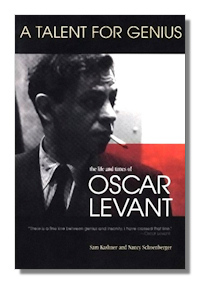 The most important, full-length biography of Levant was written by Sam Kashner and Nancy Schoenberger. They have performed an outstanding, readable, and well-founded service. Its appendices include a filmography, a discography adapted with permission from the original work of Michael Feinstein, and a substantial bibliography. Levant's own writings also deserve re-discovery. In the present context, A Smattering of Ignorance offers acute and delightful observations about the world of professional music-making and some of its leading personalities a half-century ago.